I don't like pink eyeshadow. I always think it makes me look like I have a massive rash - albeit a very pretty, shimmery rash. But in my little bag of freebies I received a pink i.d. bare minerals eyeshadow, so because I'm a very well-behaved girl who does her homework (please, don't laugh TOO loud) I thought I'd better try it out. Outer lid: Revlon ColourStay® Copper Spice quad. The verdict: A very pretty shade - the sort of colour that takes you back to an innocent, cheerful and somehow very girly childhood, full of raspberry spiders... yum.... Er, yes. Anyway. The eyeshadow itself isn't overly pigmented, which is normally what you'd expect from a loose eyeshadow - normally I only use them for eyeliner because they're so strong. But this one gets props from me, also because it gives a soft wash of colour that's easily built up. What's more, it's easy to blend. Which is funny because I used three different types of eyeshadow - The Multiple provided a cream base for the i.d. 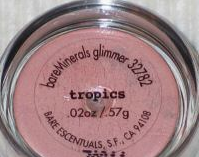 bare minerals loose powder, the Cargo one is a powder liner and the Revlon eyeshadow is the usual pressed powder. But they all blended beeeeyooootifully, and at least prevented me from looking like I had a rash so bad I need to be taken to hospital before I infect everyone else around me.